"I was running low on groceries and needed to use pantry staples to create a filling dinner for my family. I came up with this soup and now it's become a favorite in our home. For an even creamier consistency, I sometimes use a can of evaporated milk in place of the regular milk in the recipe. Leftover taco meat or shredded rotisserie chicken can be added to make it more hearty." Bring a large pot of lightly salted water to a boil and stir in macaroni from the packages, retaining cheese mix packets for later use. Cook macaroni at a rolling boil over medium heat, stirring occasionally, until tender but still slightly firm, 8 to 10 minutes. Drain and rinse macaroni with cold water. Return cooked macaroni to the pot. 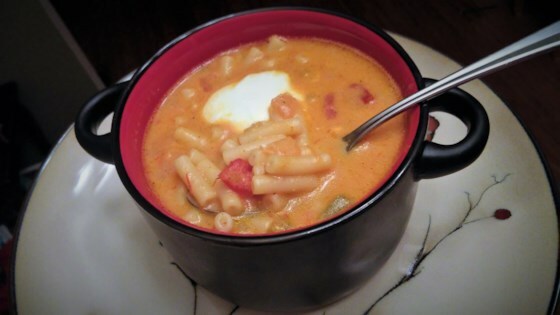 Mix butter, chicken broth, and tomatoes with macaroni and bring mixture to a simmer over medium heat; stir in garlic powder, cumin, dry mustard, pepper, and contents of cheese mix packets. Stir in milk and reduce heat to low; heat soup almost to a simmer. Do not boil. Serve soup in bowls and top each serving with about 2 tablespoons of sour cream. Leftovers refrigerate well for three or four days, but the macaroni will soak up at least some of the liquid, so you may want to add extra chicken broth when re-heating. So simple and so great tasting! I made it as directed except I couldn't resist throwing in a can of cheddar cheese soup for extra cheesy goodness.